Developed in the United States, the American Saddlebred is favored for its varied gaits that are performed with beautiful high-stepping action! These versatile horses are primarily used for saddle seat and driving competitions, but are also popular for trail riding, as their gaits provide a smooth ride. 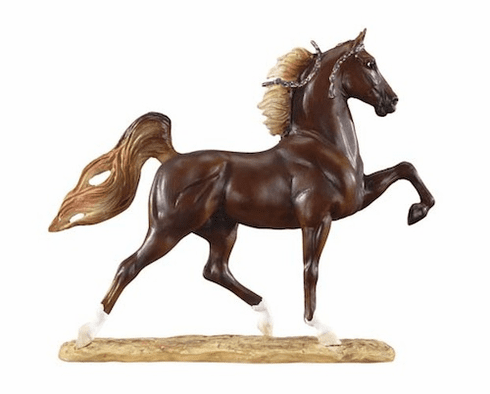 Perfect for display and collecting, this resin American Saddlebred is permanently mounted on a base, which has a descriptive back stamp. Measures approximately 5.75"L x 5"H.